In September we announced a special offer for a DIY Del Ray reader — a 50 percent discount on a 2-hour home design consult with a professional interior designer, Katie Moore of Olios Design. One of the responses we received was from Eric and Beth who say they haven’t had a chance to do anything with the rowhouse they purchased last fall. 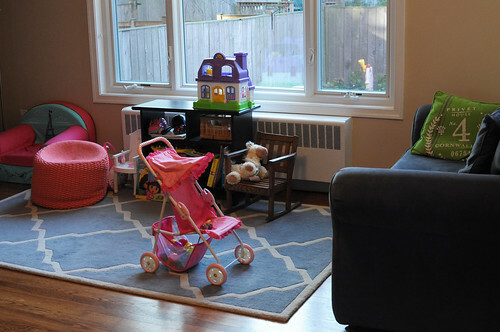 They wanted help transforming a house decorated with rental relics into a modern, yet comfortable space for them and their 2-year-old daughter Ellie. The consult was an opportunity to talk through their issues and create a plan leading them in the right design direction. Eric and Beth live in a classic Warwick Village charmer. 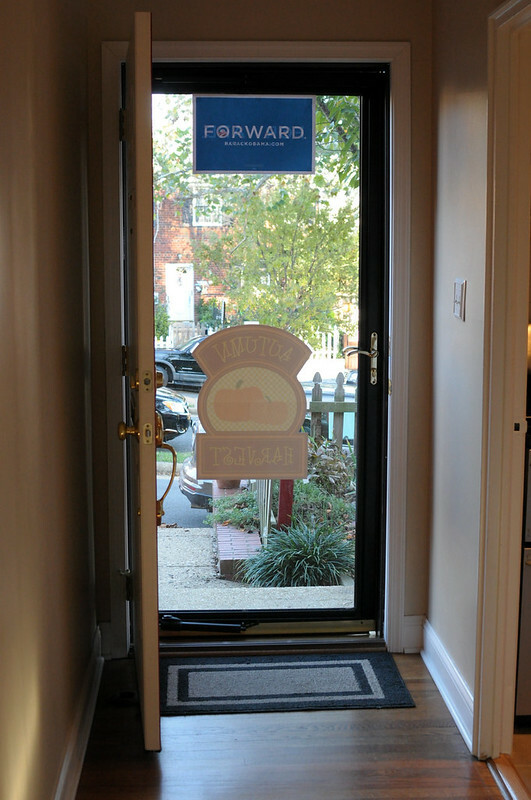 The narrow front entrance leads to an open and airy shared living and dining room. But this wide open space has caused the couple some design confusion. How do they better define the different functions in the space? How can they make it more “mature” and less like a kid’s playroom? How can they get the “put-together” look you see in magazines and on Pinterest? As we chatted and got to hear Eric and Beth’s issues and ideas, Katie Moore shared a few immediate thoughts. 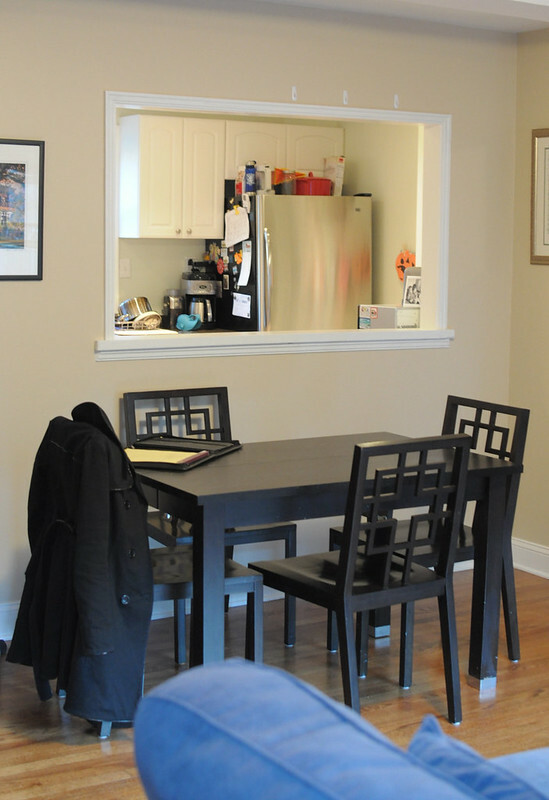 The dining table is a good size, but it doesn’t feel like it’s in a dining room. A rug underneath the table and a narrow console or buffet under the kitchen pass-thru would make it more obvious this is the dining part of the room and not just a table set off to the side. The home stagers who put the room together for sale last year had the same idea. If Eric and Beth decide they want to get a new table, Katie suggests a round table for some variation and better flow. I’m a huge fan of Flor carpet tiles for under the table — not only are they eco-friendly, but they are easy to clean and replacing a badly worn tile is easy and inexpensive. In some Warwick Village homes, the owners have opted to break down the wall from the dining room to the kitchen for a truly open-concept space. Eric and Beth want to keep the wall for now, major construction is not on their to-do list. The kitchen was well-updated by a previous owner with crisp white cabinets, granite counters, and stainless steel appliances. Eric and Beth got creative with storage by adding these functional and attractive wall shelves and butcher block top cart from IKEA. Except for the dining room chairs, there is only a loveseat in the living room. Though it has held up well, they’d like something more modern — this was Beth’s when she was single. But can they fit something other than a loveseat? The room arrangement is limited by the placement of the door to the outside and the radiator under the window. Without blocking the room’s flow, it’s clear the only place for a sofa is where it currently resides. Katie does think they should be able to fit something a little larger. A sectional probably won’t work, but a sofa without arms or with narrow arms might be a good space-saving solution. 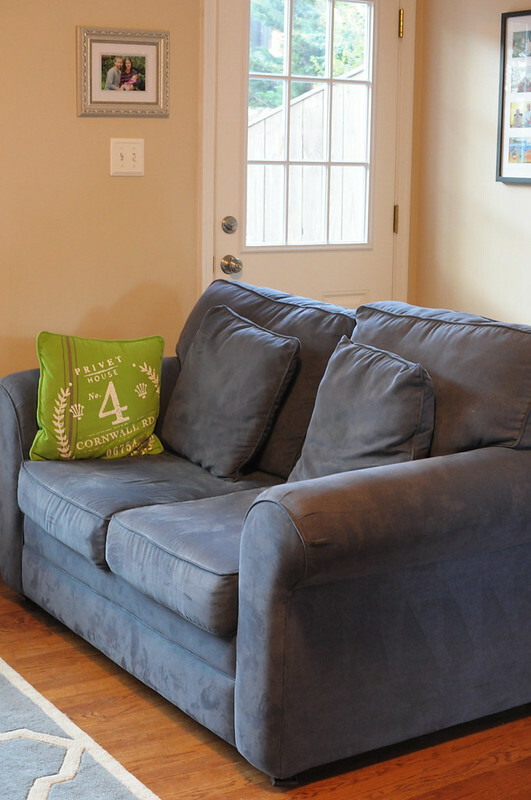 Katie suggests adding two arm chairs or an arm chair with an ottoman along the opposite wall. Adding more seating as well as a coffee table will cozy-up the living room side and create a more put together look. Eric wondered if the rug was too small, Katie assured him it’s the proper size and with more seating, it will start to make more sense. When purchasing living room furniture, Katie recommends buying the neutral larger pieces (sofa and chairs) together first. Then fill in with accent furniture, lamps, pillows and throws — these will also give you the opportunity to show off your personality. A charcoal gray sofa will work nicely with the dark wood tones and the beige walls, which they don’t want to paint right now, but it’s a possibility down the road. But where do you buy good quality, affordable furniture? And is it better to snag a deal online? Katie recommends testing out sofas before purchasing, so go to a store that has a showroom. Places like Room and Board, Crate and Barrel, and Creative Classics (in Old Town) typically have pieces that work well in small spaces and you can try them out in person. 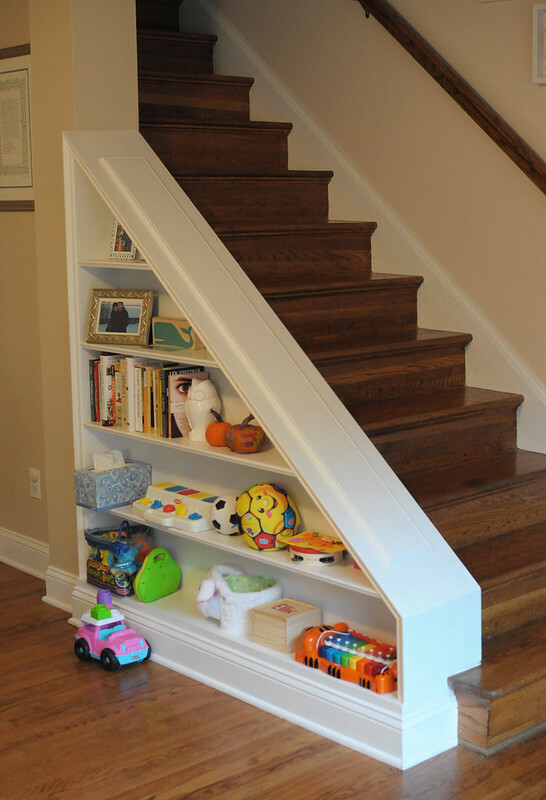 When I walked in the room my eyes went straight for this small-space masterpiece — a bookcase built into the side of the stairs. (Even better, there’s a matching one on the landing upstairs.) No design tweaks needed here, just thought I’d share this really interesting feature. But there is the issue of the toys. 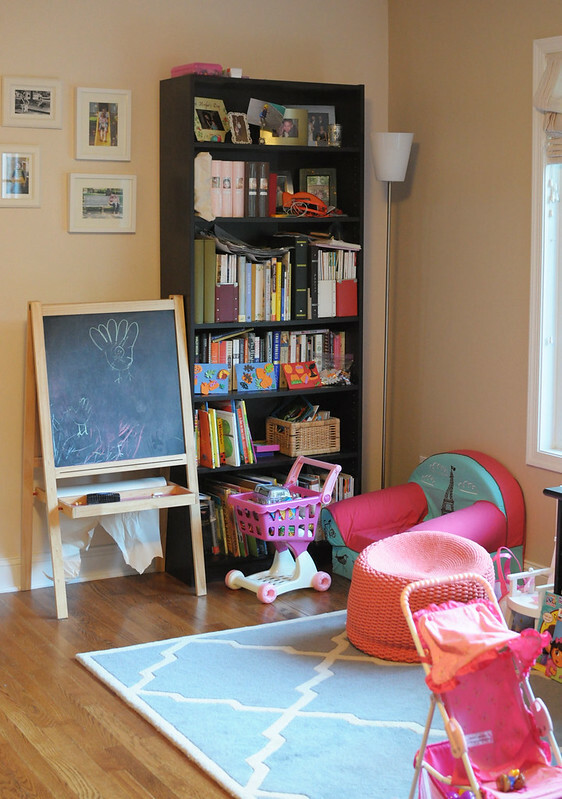 Katie suggests buying accent pieces that double as storage to keep the toys tucked away when not in use. 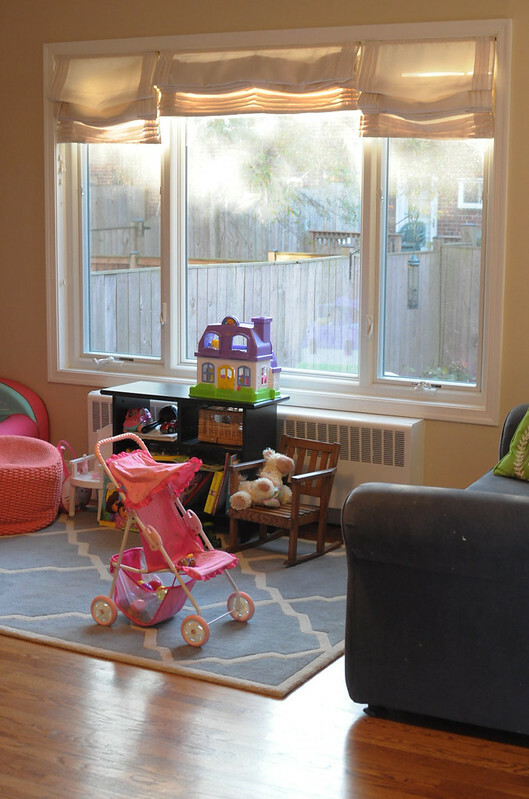 In fact they have a fabulous finished basement that they use as a playroom/family room so this isn’t the only living space in the house. A basket on a shelf under a side table and ottomans that open up revealing hidden storage inside are good options. The only light in the room is an overhead fixture and a floor lamp off in a corner, definitely a detraction to the coziness factor. But that’s an easy fix — a few table lamps on side tables (next to the couch and the new arms chairs) will give this room the warmth it deserves. The huge picture window is a great asset for this house, but it still has the window treatments left by the previous owner. Though Eric and Beth don’t feel they need to cover the window (I mean, who would want to anyway? ), Katie suggests removing the roman shades and adding some shears which would drape to the side and add a more sophisticated touch. By better defining the room’s separate areas, coordinating cozy and comfortable seating, toning down harsh ceiling lights with warm side lights, and adding more sophisticated storage and decorative pieces, Beth and Eric will be on the right track to creating an inspired modern look the whole family can enjoy. But we want to hear from you! 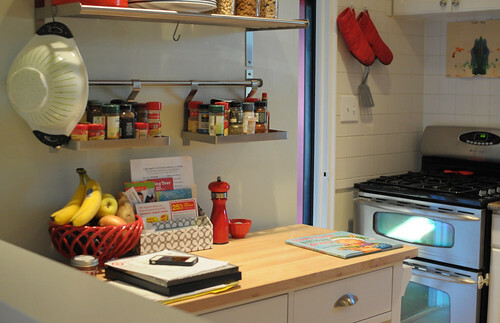 What are your ideas for Eric and Beth’s rowhouse? How do you better define space in a multi-purpose open room? If you live in Warwick Village, speak up and share how you have mastered the 1950s boxy layout? Perhaps you’d like to share a photo with our homeowners? Are there “rules” on rug size? I would have thought that rug was too small for the space, too. Under furniture? Not under furniture? Help! We just recently moved into a Warwick Village townhouse and were puzzled as well by the great room. We found the best solution for us was to put our table in front of the window and a couch, chair, and ottoman on the opposite side of the room, in front of the cut out. This has worked well for us, though I admit I’m still puzzled by what to do on the long wall parallel to the stairs/between the front and rear door. Thanks for the other good tips. Ooh — that arrangement sounds great! We didn’t even talk about that option. I like the idea of the table by the window and gazing out onto the patio/yard while eating breakfast. The long wall is definitely a pickle. We also talked about putting a narrow console table or bench along the wall by the front door with hooks on the wall for coats since the coat closet is very small. Funny you should say that! My husband just finished building us a great shelf with knobs on it and we put that inside the door. It’s great for that space. We’re thinking maybe a sideboard near the backdoor, but for now it’s pretty bare. Nice! 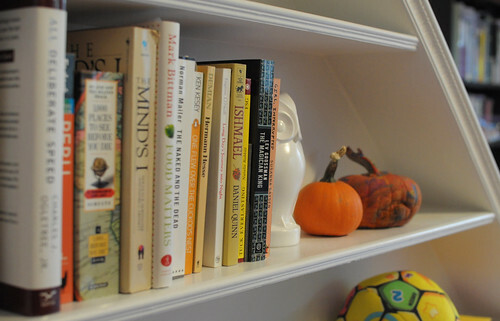 We’d love to see a photo of your shelf. I think the console is a good idea for the back door. Something with drawers or shelves would make an excellent storage piece too. We mentioned that possibility to Katie Moore, but she seemed to like the table where it was and the living space by the window. I’ve only seen the reverse where there is no cut out between the kitchen and the living room, but I’d be very curious to see how that looks! Perhaps worth a try just to see how you like it!